All SG Webserver Protection Licenses, Subscriptions & Renewals can be found on their own individual product pages or purchase them below, more options can be found on individual product pages. Can't find the part you are looking for? Contact us today! Most Sophos customers choose our Total Protect bundles. They give you everything you need to secure your organization in one easy-to-manage license: an SG appliance, a FullGuard or FullGuard Plus subscription, and your technical support. FullGuard combines all our core licenses in one cost-effective subscription for complete security: Essential Firewall, Network Protection, Web Protection, Email Protection, Wireless Protection and Web Server Protection. FullGuard Plus additionally includes Sandstorm Protection. Our BasicGuard subscription incorporates all the essential security features you need for your small business. Should you want to extend your protection even further, you can upgrade to a FullGuard license at any time. BasicGuard is only available with the SG 105, SG 115, SG 105w and SG 115w appliances. All our modules are also available as individual subscriptions. Simply choose the ones you need. Sophos RED Simply secure your branch offices by forwarding all traffic to the central Sophos UTM. Installation requires no technical training and there is no ongoing maintenance. Sophos WiFi Access Points Configurationless access points are instantly protected by the UTM, letting you create secure networks for your employees or guest hotspots for your visitors. VPN Clients Secure SSL or IPsec VPNs provide mobile and home workers with secure remote access from any location at any time. Free UTM Manager Centrally manage multiple UTM devices through IPsec VPN tunnels; deploy policies in just a few clicks. 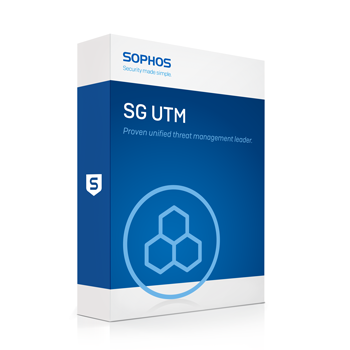 Download the Sophos SG Firewall Features Data Sheet (PDF). If your existing SG appliance does not have an active subscription or license, you will need to purchase a new license.